John Rice was born in Cumberland, son of a Chelmsford-born electrical engineer, and emigrated with his family to South Africa when aged one. Following the death of both of his parents there he lived with his step-grandmother in Springfield. Later he worked at Hoffmann’s bearings factory in the town, lodging in Navigation Road. He joined the Territorial army and after the outbreak of the war agreed to serve overseas. In August 1915 he arrived in Gallipoli where he was killed in action within a week of his arrival. A brother was also killed in 1915. In August 1914 Jack was serving 1/5th Battalion of the Essex Regiment where he rose to become Serjeant 2241. The battalion was a Territorial unit formed in 1908 with its headquarters in Market Road, Chelmsford, and it naturally contained many Chelmsford men who were to lose their lives in the war. 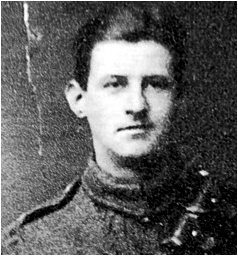 Jack had joined the Battalion prior to September 1909. The term ‘territorial’ indicated that the volunteers such as Jack who served with the battalion were under no obligation to serve overseas, with their focus on home defence, but many like him agreed to serve abroad after the declaration of war on 4th August 1914. At the outbreak of the war Jack’s battalion and the other Territorial battalions that formed the Essex Brigade were half way through their fortnight’s annual training at Clacton. On 3rd August 1914, the day before war was declared, Jack’s battalion was initially ordered back to Chelmsford, but that was countermanded and the battalion marched for Dovercourt that afternoon. The following day mobilization papers were issued to all ranks and the battalion was alloted part of a pre-arranged defensive line west of Dovercourt. On 9th August 1914 the battalion was sent to Brentwood. It did not stay there long, moving to north-east Norfolk by the end of the month. In April 1915 it moved to West Bergholt, before transferring to St. Alban’s in Hertfordshire the middle of the following month. By then the battalion, along with three other Essex Territorial battalions formed the 161st (Essex) Brigade in the 54th (East Anglian) Division. The majority of the period since the outbreak of the war had been spent training in expectation of foreign service. From St. Alban’s the battalion travelled to Devonport by train, and departed on board the S.S. Grampian on 23rd July 1915, with a somewhat depleted strength of 29 officers and 649 other ranks. Its ultimate destination was to be Gallipoli, Turkey to join the Allied forces participating in the campaign against the Turks which had started on 25th April 1915. John, usually known as ‘Jack’, was born in Keswick, Cumberland around 1892, the son of the electrical engineer William Henry Rice and Betsy Rice (nee Hockley). Stanley’s father had been born in 1865 in Chelmsford; his mother in 1859 in Mashbury. The couple had married on 3rd October 1887 at St. John the Evangelist Church in Lambeth, London. At the time Jack’s father was a 22 year-old electrical engineer resident at 3 Catherine Street, Lambeth. His mother was 28 and lived in Chelmsford. Jack’s father had begun working for the electrical engineers Crompton & Company in 1879. Jack’s grandfather was the engineer at Chelmsford Gaol. In the early 1890s Jack’s father went to South Africa to work as an engineer in the gold mines, but suffered from poor health. On 1st July 1893 Jack, his mother and two brothers set sail for Cape Town, South Africa on board the ship Dunnottar Castle to join up with their father. Whilst in South Africa Jack’s mother gave birth to a third brother, Cecil Ernest Rice (born in 1895 in Johannesburg, South Africa). Jack’s mother died in South Africa from ‘fever’ and as a result Jack and his brothers returned to England. While on board the ship that brought them back Jack’s brother, Leonard, won a cup for winning quoits. (widowed second wife of his grandfather), a cousin and boarder at 16 Randulph Terrace in Springfield (today’s 277 Springfield Road). Meanwhile his brothers, Stanley, aged 12 and Leonard, aged 13, were listed as a pupils at the British Orphan Asylum in Eton, Buckinghamshire. Family tradition recalls that Jack did not go to the orphanage due to ill-health. In 1911 the census recorded Jack and his brother Leonard boarding at 21 Navigation Road in Chelmsford, the home of the bricklayer Arthur Allen and his wife Selina. Jack was a tool a gauge grinder at Hoffmann’s bearings factory in Chelmsford. Leonard was a clerk. Jack played football for Hoffmann Athletic for several seasons. 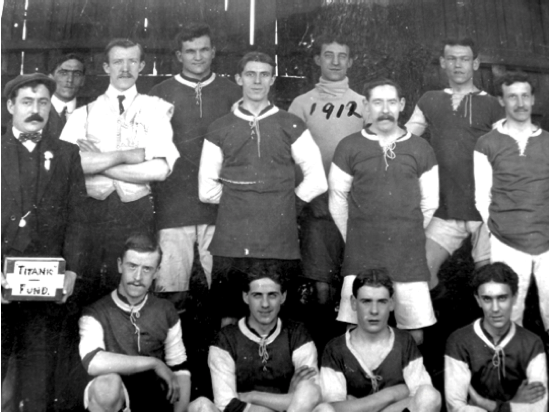 Jack is pictured, below in 1912 in a charity football team, raising money for the Titanic Fund (3rd from left in top row). “At dark there was a considerable uncertainty as to the situation on our right and the patrol work was particularly difficult. One patrol was unfortunately ambushed, and 2/Lieut. Turner, the leader, and Sergt. Rice were killed, but two men made their way back under heavy fire. Turner was an old ‘Artists’ Rifleman. He had served in France and had not been with us long, but had made himself deservedly popular. Rice was an old comrade and the steadiest of non commissioned officers. During the night the relief took place and the battle-worn 163rd got out of the line without incident. ‘Sgt. Rice’ was Jack Rice whose death in action was subsequently reported to have occurred in the early hours of 15th August 1915. He was 22. Jack has no known grave and is commemorated by the Helles Memorial in Turkey. 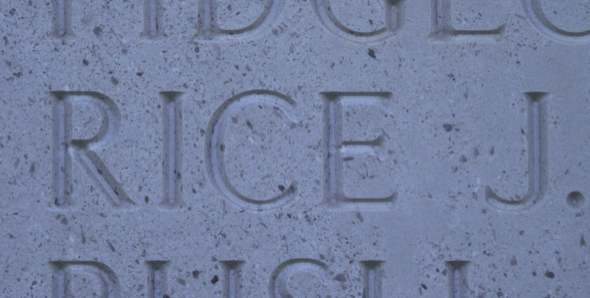 Jack’s and Stanley’s names are not among the 359 remembered by the Civic Centre Memorial, Chelmsford. ““LADY SNIPERS. Miss O. Willsher, of Greengates. Radlett. Herts. has received a letter her brother, Drummer F. Willsher, of the 5th Essex, now in the Dardanelles. Writing of the first time the 5th went under fire, he says their conduct under a hail of shot and shell was marvellous, and one the " boys" from had the courage to run back and pick up his ration bag winch he had dropped. At dusk on the day of advance entrenched themselves, and a party, which included Jack Rice, of Chelmsford, volunteered to go out to ascertain the enemy's movements. The snipers, says Drummer Willsher, are the worst. They (the Turks) have even got lady snipers. One woman was caught with a dozen British identity discs round her neck. and half a dozen pay books and over £5 worth of English money upon. One wounded Turk on being brought in exclaimed. "Me have fight; German officers shoot," meaning he had to fight or German officers would shoot him. The Drummer is enthusiastic about the New Zealanders and Indians who, he says. are the boys to fetch out sniper; they seem enjoy the sport. An Indian had his mule shot by a sniper. He was soon out after him, and in less than half an hour the Indian came proudly into camp with the sniper's head under his arm. Jack’s brother Cecil (pictured above left) also served in the army, as Private 2640 in the Australian Infantry Force, having been sent to Australia before the war. He joined up in June 1915, embarked from Brisbane two months later and served in Gallipoli and France where he was wounded in 1916. He was returned to Australia the following year, was a talented golfer, and ran a business. Their brother Leonard, pictured left, also served in the army during the war, and later worked as an accountant before rejoining the army. Leonard excelled at cricket, and is thought to have played for Essex at one time. He was also a talented swimmer and diver and died in 1957.